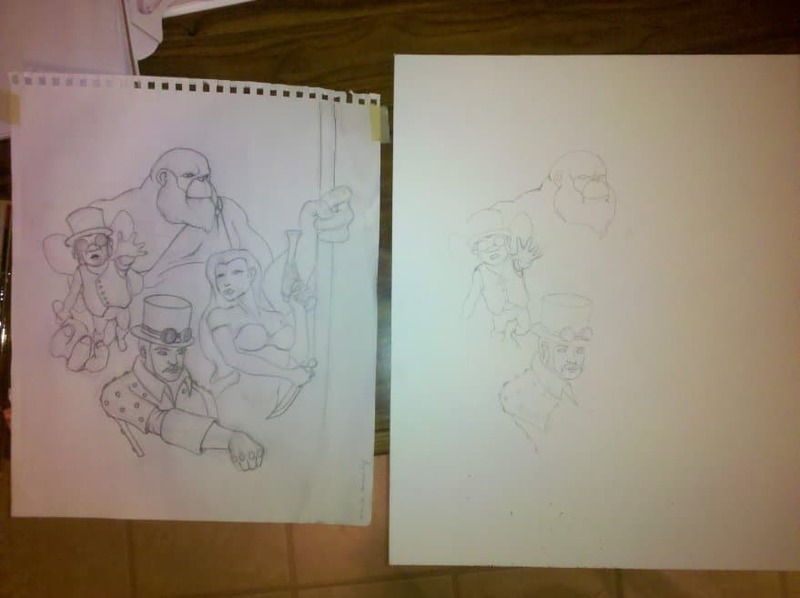 Step 1 – Transferring the image from the original sketch to the canvas board. Every once in a while, I feel the need to set down the digitizer tablet, or digital sketchbook and just get my hands dirty. It’s not real often these days as I don’t really have much time to spend on individual images, and traditional paints just take so much longer. But when you gotta, you just gotta. My girlfriend and I like to create art together sometimes, and this weekend we found ourselves with precious little on the calendar, so we agreed it was time to do some painting. I’m really happy that we did. It feels like it’s been too long for me. Don’t get me wrong, I love the digital work. I love the speed that it allows me to work. That quickness placates my ADDish nature. I can be done with a project before it really bores me. But, like I said, sometimes you just have to get your hands dirty. 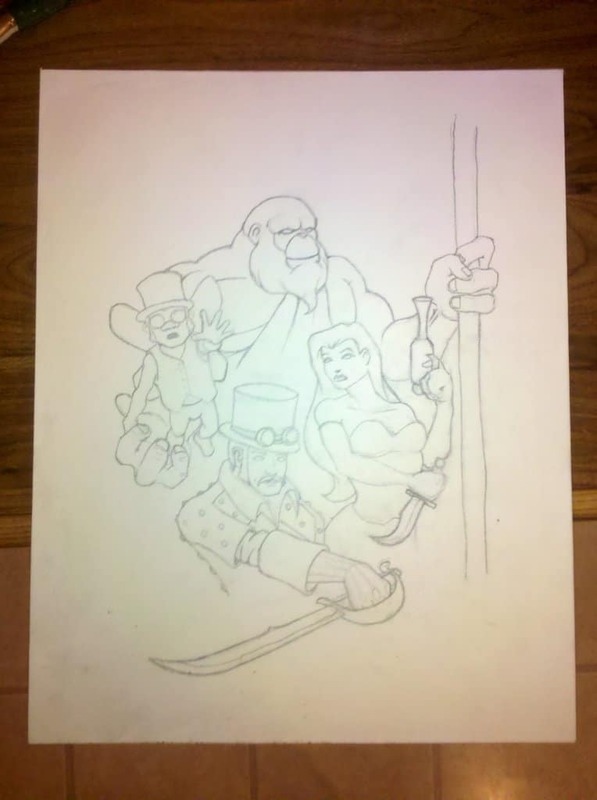 Step 2 – Completely revamping the linework. So as you can see – Step 1 is simple enough. 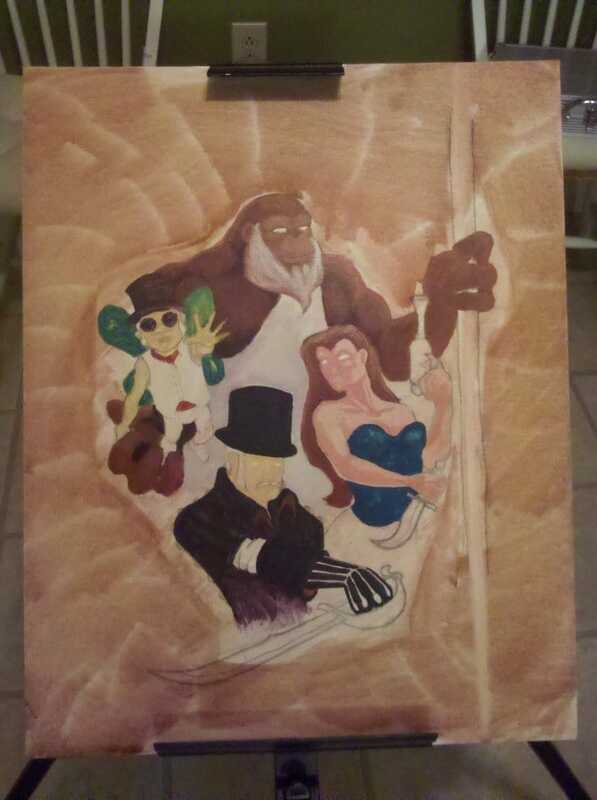 I did a sketch back when we were on vacation a few months ago, and I thought that it would work as a decent painting so I transferred it to a canvas board. There are a number of ways to do this, but I decided to keep it simple. I covered most of the back side of the page with pencil rubbings and then placed the sketch on the canvas board, retraced my line work, and then removed the original sketch. I should have spent a little longer laying the image down on the canvas board. I think that I placed it a bit low. I’m not beating myself up too terribly badly as I was thinking of adding some text across the top when I’m done, so the low arrangement of the image will allow for that. Step 2 (sorry for the glare) shows that I’ve completely gone over the line work now that the image is on the canvas board. This took a little while, and I started finding that I was smudging the graphite all over the image in the lower right hand corner. I erased all the smudges with a gum eraser before applying a fixative layer and then a simple wash. Step 3 we see that I’ve (finally) added some paint. I’m using acrylics and it’s nice that they dry as fast as they do. 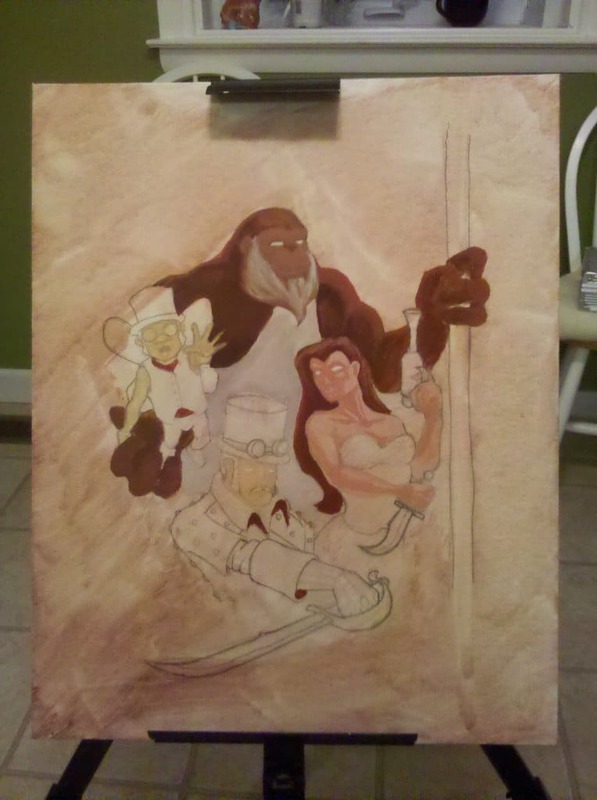 I can work on one part of an image and then let that dry as I work on another part. This image is steampunk themed, so I want to keep it mostly in brown tones – almost like a sepia toned photo in order to build the ambiance. It’s also fantasy though, so we’ll find (later that I let some other colors creep in a bit. The wash really seems to help with the mood though. Another color note: I want to keep each of these characters very separate from their counterparts while still creating a sense of ‘this is a team’, so I’ll use color to do that. Each of their flesh tones is significantly different from each other, but I moved from one to the next, taking some of the previous character’s color to start the color of the following character’s skin tones. 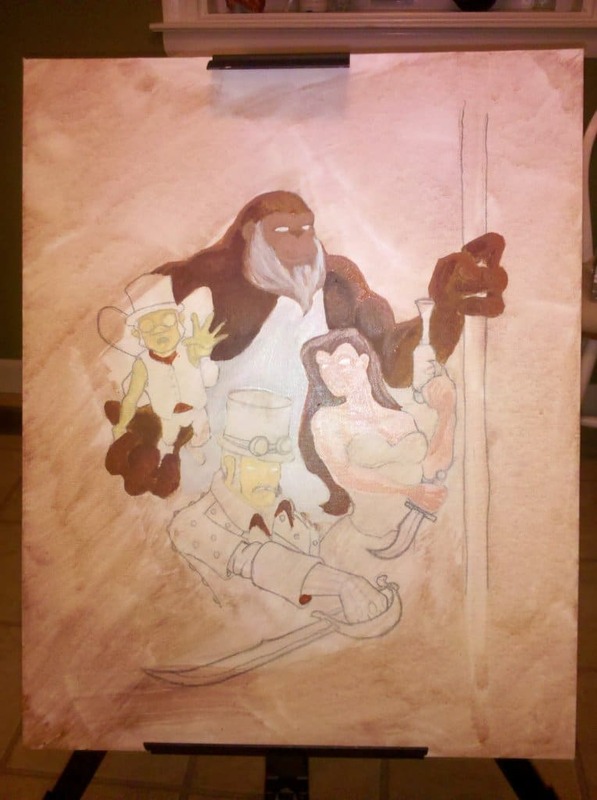 Thus, the color of the Troll (in the back) started the color for the girl, who in turn, started the color for the guy down in front. I continue with this little trick in Step 4 – using girl’s hair color as a base for the Fey Troll’s shirt. I’m also paying attention to where I place color in an attempt to keep the image colors balanced. Too much of one color in one direction can cause an image to visually slide on the canvas. Of course, I don’t want everything perfectly balanced either. Balanced = boring. There needs to be a little motion to keep the viewer’s interest. Step 5 – We’re calling it a night. This brings us to Step 5 – the point where I’m calling it a night. I had a smudge of green paint that I tried to clean up in the lower left corner of the image. The good news is that I got the smudge off the canvas. The bad news is that almost all of the wash came with it. So I went about re-washing the outer edges of the images. I noticed the ‘light spots’ that were forming as I worked and I decided to make them happen on purpose – they kinda reminded me of the cogs of a gear, which works for me. Who knows, I might see it tomorrow and decide to re wash it again. We’re starting to see those brighter colors creep in that I mentioned earlier. I may make them a little more subdued when I see them tomorrow. I’ll post some more updates as I work. Thanks for following along! Please let me know if there’s any questions you have about this process and I will answer them as best I can. Love the previews… looking forward to these finished!